The rotary-powered Hercules W-2000 motorcycle is real. I know this, because I saw one with my own eyes at Merks Motor Museum in Nuernberg, Germany, and I’m now fundamentally changed because of it. You will be, too, after reading about this amazing machine. We here at Jalopnik love rotary engines for their ridiculous sound, crazy high revs, technological quirkiness, and also the fact that they’re usually found under the hoods of some seriously cool cars. It turns out, they’re also found bolted to the frame of some motorcycles, like the Suzuki RE5. The Hercules W-2000 I saw in Nuernberg. But forget about that Suzuki—it was just a follower. The real innovator, the first motorcycle manufacturer with the balls to chuck an unproven engine type—a Wankel Rotary—directly under the buttocks of a living, breathing human being was a German company called Hercules. Started as a bicycle company by a man named Carl Marschütz in Nuernberg, Germany, in 1886, the goal of Hercules was to provide Germany with bicycles for everyone at a time when a decent bike cost about 170 marks (or about 10 weeks salary for your average German worker). The company started cranking out “velocipeds” in the 1880s, building 100 in the first year, 186 in 1887, and 400 by 1888. By the time the company had been in business for a decade, production numbers had risen to 6,500 bicycles. Shortly thereafter, Hercules (then called “Velocipedfabrik Marschütz & Co”) dabbled a bit with electric cars, building a four-wheeler that could reach 25 mph and travel 25 miles per charge. But cars weren’t what Hercules’ would eventually build its brand upon—no, after building its first prototype in 1904, Hercules became all about motorcycles. The first bike, which went into production in 1905, came with an engine made by Belgian ammunition company-turned-motorcycle manufacturer “FN.” That motor worked with a magneto ignition system and carburetor to produce 4.5 horsepower, which it sent to the rear wheel via a belt drive. Hercules continued building motorcycles into the 1920s and 1930s, mostly designing the frames, and bolting on engines from outside manufacturers, especially prominent two-stroke engine manufacturer Fichtel & Sachs (which later became part of ZF, a company we know today as an automotive transmission manufacturer). One of the more well-known engines from the company was a 1.2-horsepower 60cc “Saxonette” engine, which was integrated with the firm’s “Torpedo” free wheel hub, and bolted onto a Hercules Frame. The bike could reach a maximum of 19 mph. Photo: Hercules. The Saxonette bolted to a Hercules bike. Unfortunately, Hercules’ founder Marschütz—who was Jewish—had to flee Germany from Nazism and head to California in the 1930s. Between that and 75 percent of its manufacturing plant being destroyed and ransacked during the war, Hercules’ bike production came to a halt during WWII. It wasn’t until the 1950s that the company rose from the ashes, and helped fill the country’s demand motorcycles. The company was purchased by its engine supplier Fichtel & Sachs in the 1960s, and later produced the popular electric E1 city bike in the mid 1970s. Around the same time came a much more exciting bike to the Hercules stable: the W-2000, the world’s first Wankel-engined motorcycle. After Felix Wankel at German automaker NSU designed the first viable rotary engine in the 1950s, Sachs was among the first companies licensed to use the technology in its products. The company decided around 1970 to integrate a rotary into its Hercules motorcycle line, showing the W-2000 at the 1970 West Cologne Fall Motorcycle Show. The 294cc engine, which you can see up close below, produced 27 horsepower, and was air-cooled, using an axial fan mounted to its front to pull in air (especially while idling) to keep the engine at the right temperature. That single-rotor motor was bolted under a tube-steel frame with a front disk brake and a rear drum stopping 18-inch wheels. The engine fed fuel through a Bing constant-velocity carburetor and turned its power 90 degrees through a six-speed transmission, before sending that power to the rear wheel via a chain drive. Sadly, Hercules only sold about 1,800 of the bikes between 1974 and 1977 (though this model is labeled a 1979, for reasons I haven’t surmised). 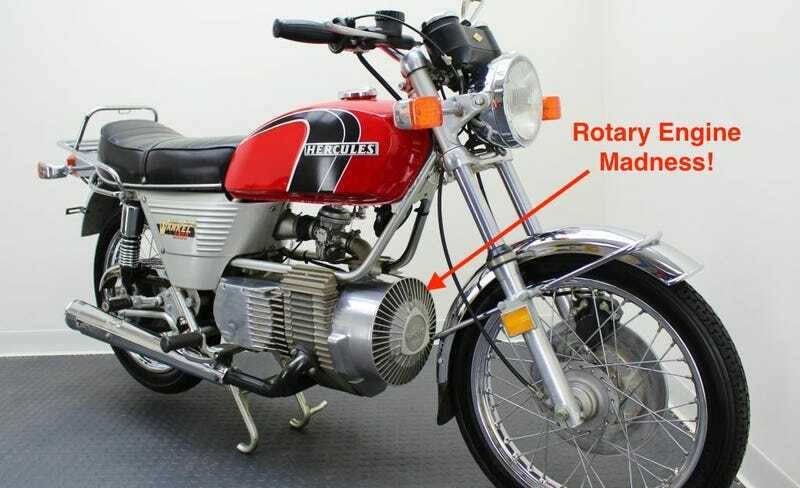 The weird rotary bike, which sold as a DKW in some markets, didn’t do well in sales in part because of the lofty $1,900 price tag, the mystique surrounding rotary technology, and because of a rather strange riding experience hampered by low ground clearance and strange power delivery. Despite its poor sales, the Hercules W-2000 will go down in history as a true pioneer. And after having seen one up close, I can say that I want a W-2000 in a bad way. Just look at how the rotary engine seems to just dangle from the frame. It’s two-wheeled perfection. What&apos;s The Weirdest Motorcycle Ever Made?